I made this for dinner and had the hardest time coming up with a name for it. I wanted to call it a pot pie, but in my opinion, a pot pie should have gravy. There’s no gravy in this recipe. I considered calling it a pasty, but pasties are supposed to be little half round things that are crimped shut. It’s sort of a giant hot pocket, but pan pocket sounded too weird, so I opted for Crescent Squares because it has a crescent roll crust and is cut into squares for serving. This recipe is very easy to make, and variations on this recipe have all been big hits with the family. I was very optimistic about serving this one, and it was very well received. Baker’s Man finished off the leftovers having a serving for breakfast and one for lunch. 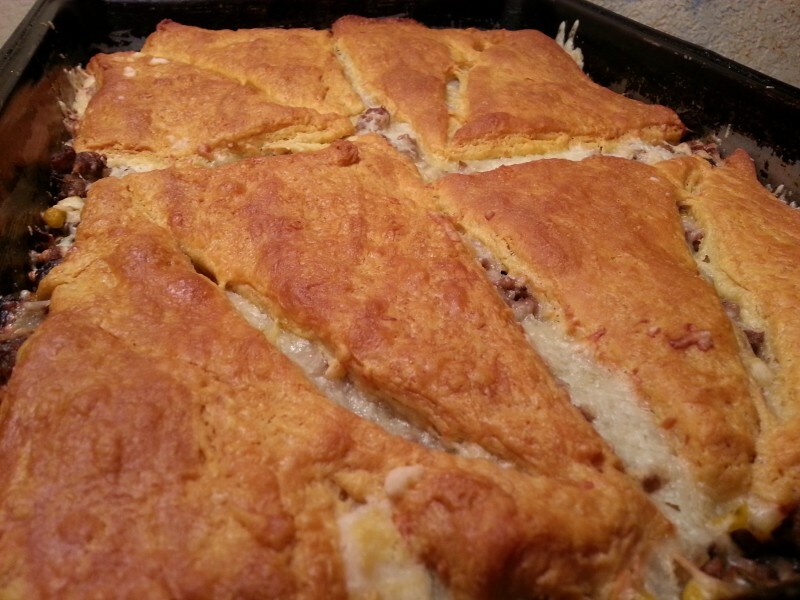 What’s not to love when you combine browned ground beef with the flavors of the southwest and serve it between two layers of crescent roll. Here’s your recipe. Give it a try and let us know what you think. Thanks for visiting Patty Cake’s Pantry. 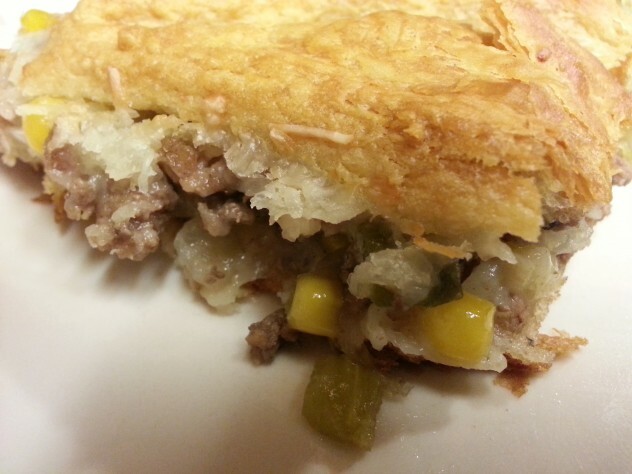 Ground beef, onions, garlic, and cheese are sandwiched between two layers of crescent roll dough along with corn, black beans, peppers, and green chilies to make a simple and delicious dish. 1 cup shredded Monterey Jack cheese. Brown ground beef with onion, garlic, and bell pepper until meat is cooked and vegetables are tender. Stir in diced green chilis, black beans, and corn and mix well. Remove meat mixture from heat. 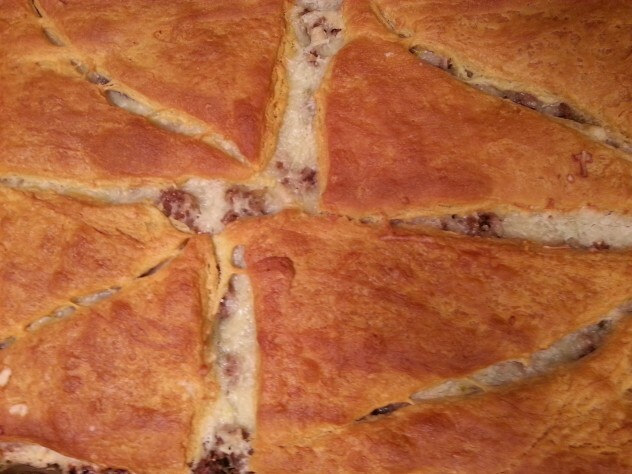 Spread one package of crescent roll dough on the bottom of a 9X13 inch pan that has been sprayed with non-stick spray. Seal seams between rolls. Carefully spread meat mixture on top of dough. Sprinkle with shredded cheese, ensuring that cheese is evenly spread over the top of the meat. Cover meat and cheese mixture with the remaining sheet of dough. Bake in a 350 degree oven for 20 - 30 minutes or until golden brown. Cut into squares and serve. Was that the recipe with cream cheese, chicken, and chives? If so, it was one of my newlywed dishes,too. Subscribe to have each new post delivered to your inbox.